Building on unique insights from a diverse panel of experts as well as the work of leading think tanks, MForesight’s report on Engineering Biology presents a range of options for how federal agencies, private firms, and academic institutions can overcome these challenges. The report puts forward a sensible way for stakeholders to increase the speed and reduce the cost of product development: through collaborative investment in standardized host cells or strains. The key platform technology—Standardized Verified and Tractable Host Cells or Strains for Biomanufacturing—will provide industries with host cells and strains that are amenable to engineering for scale-up or scale-out. The standardized and verified nature of these hosts will streamline regulatory processes and significantly de-risk aspects of the biomanufacturing process. The report was available to read at the 2016 MForesight National Summit where the 120+ attendees included members of industry, academia, and government, all with an interest in manufacturing. The report draft was released online in December 2015, with the final version released in August 2016. Engineering Biology seeks to apply engineering principles to design, modify, and produce customized biological components and systems. The recent advent of tools such as the CRISPR/Cas9 system for gene editing and gene regulation has sharply accelerated development in this exciting field. However, several challenges need to be addressed in order to transition laboratory-scale results to commercial-scale solutions. 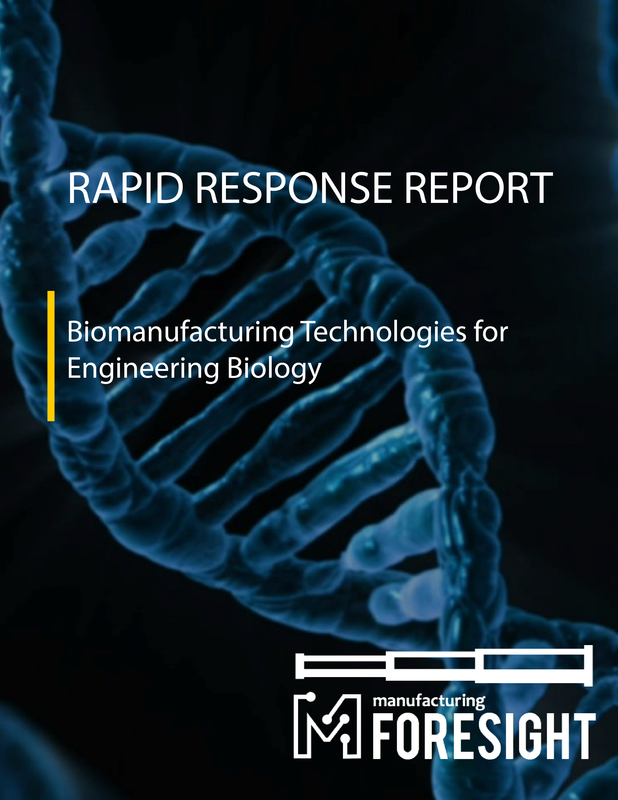 This report identifies emerging platform technologies that, if matured, will accelerate the growth in the rapidly changing field of Engineering Biology. The conclusions in the report are intended to guide stakeholders from government, industry and academia as they seek to further develop innovations in this field. The platform technologies must be cross-cutting, with broad applications across the engineering biology industry. The maturity of the technologies must be suitable for both private industry and government to consider investing in further development. The new technologies should increase the likelihood that the technology will give the U.S. a first-mover advantage in the marketplace. Sunil Chandran is a Senior Director in the R&D division at Amyris. His primary interests lie in the field of metabolic engineering for the microbial production of chemicals and fuels. While the metabolic engineering community has been extremely successful in commercializing microbial processes, optimization of microbes for economical industrial-scale production of target molecules requires numerous changes to the genetic code of the microbe, which is extremely time-consuming. His focus is to accelerate the design-build-test-learn cycle within any strain engineering endeavor by reducing the cost and effort of performing molecular biology, while simultaneously increasing throughput. Dr. Chandran holds a Ph.D. in Organic Chemistry from Michigan State University and has more than a decade of experience in the field of synthetic biology. Steve Evans is a Fellow in Dow AgroSciences Seeds Discovery R&D division. Since joining Dow AgroSciences, Steve has been involved in development of several traits stemming from the Mycogen pipeline (cry1F, cry34/35) and in capability development in bioanalytical sciences. In his current role, Steve continues to help identify and acquire differentiating bioanalytical capabilities and to enable EXZACT™ Zinc Finger technology. Steve is past chair of the Industrial Advisory Board of the Synberc synthetic biology consortium funded by the NSF, co-chair of the BIO Organization IES synthetic biology subteam, and past chair of Dow AgroSciences Fellows Organization. Steve was an NIH Post-doctoral Fellow in the Department of Chemistry at the University of California, Berkeley. He opted for a second Post-doc at the USDA National Lab in Peoria where he moved into agricultural applications of biotechnology in ruminal anaerobes. From there, he joined Mycogen Corporation in 1988 and joined Dow AgroSciences in the acquisition in 1997. Steve received B.A. and B.S. degrees in Chemistry and Microbiology, respectively, from the University of Mississippi in 1981. He completed a Ph.D. in Microbial Physiology from the University of Mississippi Medical Center in 1985, with an emphasis on trace metal metabolism and siderophore production. Jeffrey Kim holds appointments at the Society of Industrial Microbiology and Lawrence Berkeley National Lab. He co-founded Radiant Genomics, a biotechnology company which focuses on genomics-guided natural product discovery, where he is the CEO and CSO. Dr. Kim has 17 years of academic and industrial experience at the interface of biophysics, biochemistry, metabolic engineering, and genomics. Dr. Kim has led multiple international research projects for industrial products in addition to collaborative research grants from the National Institutes of Health and Institute of Allergy and Infectious Disease. He has authored key publications and patents in diverse fields including drug discovery, biophysics, and material science. Dr. Kim received his A.B. in Molecular Biology from Princeton University and his Ph.D. in Biochemistry from Rockefeller University. Stephen Laderman is Director of Agilent Research Laboratories, the central research laboratories of Agilent Technologies, Inc. Laderman joined Hewlett-Packard Laboratories as a member of technical staff to develop novel processes, materials and high performance devices for advanced electronics and photonics, and rose through the ranks to head the Hewlett-Packard Laboratories’ Chemical and Biological Systems Department in 1996, and help develop HP’s first DNA microarray products. In 1999, Laderman continued to expand his team’s efforts on developing products in life sciences and molecular diagnostics in Agilent Technologies. In 2005, Laderman received Agilent Laboratories’ highest award, the Barney Oliver Prize for Innovation. Laderman received his A.B. with honors from Wesleyan University in Physics and his Ph.D. from Stanford University in Materials Science and Engineering. Kelvin H. Lee is Gore Professor of Chemical and Biomolecular Engineering at the University of Delaware and is Director of the Delaware Biotechnology Institute. Prior to his current appointment, he was at Cornell University where he held the titles of: Samuel C. and Nancy M. Fleming Chair Professor, Professor in the School of Chemical and Biomolecular Engineering, Director of the Cornell Institute for Biotechnology, and Director of the New York State Center for Life Science Enterprise. He is a fellow of the American Association for the Advancement of Science and of the American Institute of Medical and Biological Engineering. He serves as an advisor to a number of small and large biopharmaceutical companies. Professor Lee received his bachelor’s degree from Princeton University in 1991, his Master’s Degree from the California Institute of Technology in 1993, and his Doctorate from California Institute of Technology in 1995. Dr. Kip Ludwig is currently the Associate Director of the Mayo Clinic Neural Engineering Laboratory, Vice-Chair of the Enterprise Neurosurgery Research Program, and independent investigator at the Mayo Clinic, charged with developing a world-class research program in the area of neuromodulation therapies for end-organ systems. Prior to Mayo, Dr. Ludwig served as the Program Director for Neural Engineering at the National Institutes of Health. He co-led the Translational Devices Program at NINDS, led the NIH BRAIN Initiative programs to catalyze implantable academic and clinical devices to stimulate and/or record from the central nervous system, and led a trans-NIH planning team in developing the $250 million S.P.A.R.C. Program to stimulate advances in neuromodulation therapies for organ systems. Dr. Ludwig received his Ph.D. in Bioengineering at the University of Michigan, followed by post-doctoral studies at the same institution. He has also worked as a research scientist in industry providing oversight of Good Laboratory Practice (GLP) and non-GLP studies enabling clinical trials in Europe and the United States which lead to approval for sale in the European Union and a U.S. Pivotal Trial. Dr. Mary Maxon is the Biosciences Principal Deputy at Lawrence Berkeley National Laboratory. Previously, she was Assistant Director for Biological Research at the White House Office of Science and Technology Policy (OSTP) in the Executive Office of the President where she was the principal author of The National Bioeconomy Blueprint. Before moving to OSTP, Dr. Maxon ran the Marine Microbiology Initiative at the Gordon and Betty Moore Foundation. Prior to that, Dr. Maxon served as Deputy Vice Chair at the California Institute for Regenerative Medicine, where she researched and drafted intellectual property policies for California stem cell grantees in the nonprofit and for-profit research sectors. Previously, she was Associate Director and Anti-infective Program Leader for Cytokinetics, a biotechnology company in South San Francisco. Her biotechnology experience also includes a position at Microbia, Inc., based in Cambridge, Massachusetts, where she contributed to the discovery and development of the Precision Engineering technology for production of commercial products from microorganisms using metabolic engineering. Dr. Maxon received her Ph.D. from the University of California, Berkeley in Molecular Cell Biology, and did postdoctoral research in biochemistry and genetics at the University of California, San Francisco. Virginia (Ginni) Ursin joined Monsanto as a research scientist in 1991 where she has led several research programs, authored numerous scientific papers, and holds several patents. Ginni is currently a member of the Monsanto Technology Prospecting team and is a Monsanto Science Fellow. She is vice-chair of the Synberc IAB and a member of the executive board of the EBRC. Ginni received her B.S. in Plant and Soil Sciences from the University of Massachusetts in 1982 and her M.S. in 1983 from University of California Davis Department of Vegetable Crops. She received her Ph.D. in Genetics from UC Davis in 1987. She has held a post-doctoral appointment as a Research Geneticist at the USDA Plant Gene Expression Center in Albany, California and at Calgene Inc, a California-based biotechnology company.